Now, as more OS7 themes start rolling in, here’s on really nice and customizable on for you, which comes in many different colours for you to pick from. 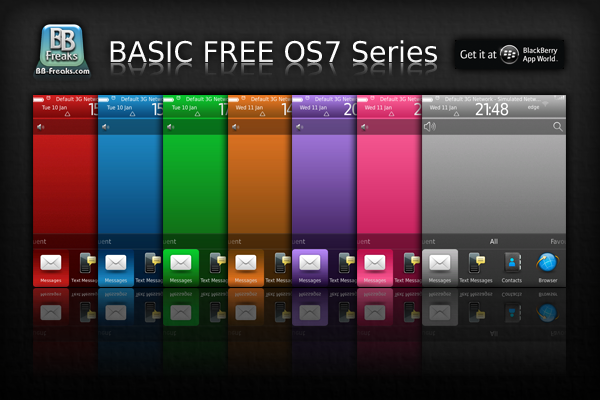 Thats right, we are referring to the check out the new and FREE Basic OS7 Series by BB-Freaks. Well, for theme junkies, BB-Freaks have been churning out quality themes for quite some time and its no wonder that this would be of quality as well as being wallpaper friendly for customization to the maximum. The best part is, not of is it FREE, its also compatible with all devices running OS 6 and OS 7 (Curve 9350/60/70, Bold 9900/30, Torch 9810/50/60)!! To get this marvelous theme, just head over to BlackBerry App World to pick up your favorite color and start enjoying this clean and simple theme today! Hit us up in the comments to let us know what you think of it and which did you download! Can I get themes directly from this site?